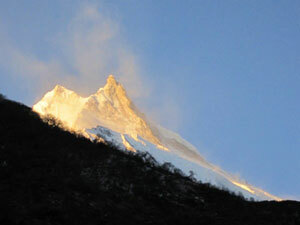 Trekking in Nepal along the Manaslu circuit will be an extremely rewarding experience. You will indulge with full splendor of the Manaslu regions natural beauty, offering unsurpassed views of the Manaslu sanctuary. Manaslu Trekking will give an opportunity to interact with a cirque of awe-inspiring peaks over 6500 meters, including the awesome Manaslu Himal and Ganesh Himal. The journey starts unfolding with the majestic views of ancient oak and rhododendron forest, and terraced fields of rice and millet, waterfalls, and the world of snow and ice. The trekking trail starts from Aarughat. It is also a small town of Gorkha district and follows the ancient salt-trading route along the Budhi Gandaki River. Manaslu region is full of austere monasteries, Mani walls, Chortens, and other Buddhist religious landmarks. The valley is a sanctuary to many highly endangered animals, including snow Leopards and Red Pandas. Manaslu trekking route is characterized as a narrow winding track in the lower valley with many suspension bridges. You can observe yourself sharing trails with trains of donkeys carrying goods for local villages and guesthouses. The trail also has many steep, narrow sections and trekkers may find this quite challenging, make sure you are on the cliff side when a donkey passes you!. Above 3000 m the valleys widen and the trail opens up presenting magnificent views of the Manaslu Range and Conservation Area. The trek can finish comfortably in 17 days and can also shorter in 13 days. This trek also has done with/without porters. Manaslu Trekking can give you more experience on hiking steep sections, especially if trekkers are carrying their own packs. The circuit is more remote compares to Annapurna with the closest transport locations being Aarughat and Dharapani. Day 20: Final departure to international airport or further program according to flight schedule.